Do you hear that? 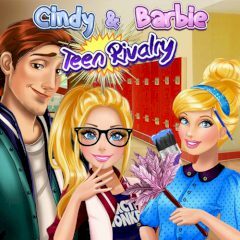 Cindy and Barbie are fighting again! They can't decide who is the best girl in the class. But today we are going to help them. Make some challenge for the girls and see who will complete it better. Two girls always fight with each other for the right to be called the best in the classroom. However, they both have their own talents and it's hard to decide who is actually better. Likely, we you can help them to end their eternal battle and tell which girl makes it better. Split them and give some tasks. Cindy and Barbie will try hard to prove their position!